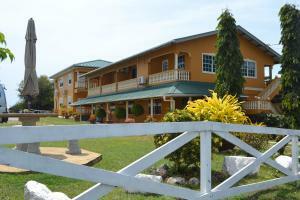 ﻿ Best Price on Miller's Guest House in Buccoo + Reviews! Offering an on-site restaurant, Miller's Guest House is a beachfront property located in Buccoo. Free WiFi access and free private parking are also available. Each room here will provide you with air conditioning, bed linen and cable channels. Private bathroom also comes with a shower. At Miller's Guest House you will find a garden, a terrace and a bar. Other facilities offered at the property include a tour desk, luggage storage and laundry facilities. An array of activities can be enjoyed on site or in the surroundings, including golfing, horse riding and fishing. Arthur Napoleon Raymond Robinson International Airport is a 17-minute drive away. 50% of the total payment via bank transfer or Western Union is required at least 7 days prior to arrival. The property will contact you after you book to provide instructions. Guests are required to show a photo ID and credit card upon check-in. Please note that all Special Requests are subject to availability and additional charges may apply. Please inform Miller's Guest House of your expected arrival time in advance. You can use the Special Requests box when booking, or contact the property directly using the contact details in your confirmation.